1. For Fish Sticks: Preheat oven to 450°. Spray rimmed baking pan with nonstick cooking spray. Cut fillets into 3 x 1-inch sticks. 2. In food processor with knife blade attached, process cornflakes, dry mustard and garlic powder 1 to 2 minutes or to fine crumbs. Transfer mixture to wide, shallow dish. In separate wide, shallow dish, whisk egg whites until frothy. Place flour in third wide, shallow dish. 3. 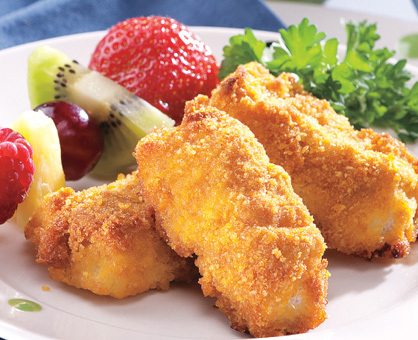 Dip fish sticks in flour, then in egg whites, then in cornflake crumb mixture, patting lightly so mixture adheres; place on prepared baking pan. Lightly spray fish sticks with cooking spray. Bake 10 minutes or until fish sticks are lightly browned and crispy and internal temperature reaches 145°. 4. For dip: In small bowl, whisk together all ingredients. Serve with fish sticks.